Warmth, character and flexibility - MPX is a great choice for those seeking a classic sound. Wonderfully warm sound. Felixble onboard delay. Further sound colouration from wow and flutter. Despite the relentless march of futuristic-sounding plug-ins, it's fair to say that we're currently experiencing a renaissance as concerns replicating the sound of yesteryear. 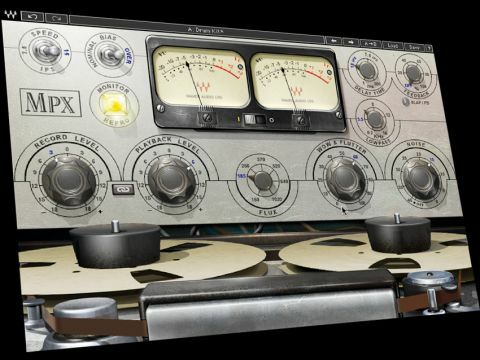 Suddenly, the marketplace is awash with plug-ins aiming to recreate the sound of analogue tape, as our fascination with taking pristine digital audio and 'warming' it up with retro crunch continues. "This is a great-sounding plug-in that's suited to individual track elements and output settings alike." Plug-in giant Waves is the latest to dip a toe into this water with its MPX plug-in, which was developed in collaboration with engineer/producer Eddie Kramer. The speciﬁc tape machine modelled here is rare and customised, featuring an Ampex 350 quarter-inch machine with 351 electronics on-board. This means that it's now possible to model Kramer's signature Olympic Studios sound as the separately available Kramer HLS Channel plug-in emulates the sound of the desk used 'before' this tape solution as his setup of the time. The GUI is nicely designed, with spinning reels in the lower section that match your choice of tape speed and a range of ﬂexible options above. Starting on the left, you'll ﬁnd Record and Playback levels, which determine the gain strength passing through the respective heads of the tape machine. These dials can be linked so that Playback automatically adjusts to compensate for the Record level, though de-coupling this option provides a greater range of sounds. Further across, Wow & Flutter and Noise dials bring characteristics to your tracking/mix elements with anything from mild colouration to full-on degradation possible. At the top, three dials allow you to bring tape delay effects to the process too, with the ﬁrst offering variable Delay Time, the second setting feedback level of these taps (with a switch to toggle between Slap and Feedback effects) and an optional low-pass ﬁ lter to allow for tone control of any delay you set up. This additional section is wonderful - fans of dub-based tape delay effects will have a ﬁeld day as some wonderfully trippy sounds can be created which greatly enhance the sonic possibilities afforded by MPX. Offering similar ﬂexibility, Bias offers two options - Nominal and Over. The former matches the manufacturer's recommended calibration setting, while 'Over' allows the user to experiment, as many engineers did, with pumping extra juice through the system to enhance the sound. Two additional parameters complete the parameter line-up, in the form of Flux and Noise. As tape technology developed, so its ability to withstand increasing amounts of gain evolved too. A huge set of developments in tape-recording history can be emulated via this dial, while Noise allows you to tune the level of tape noise to your project to leave it sounding warm and pristine, or saturated and crunchy. This is a great-sounding plug-in that's suited to individual track elements and to output channel settings alike. Its mastering settings work well at the end of a fully emulated tape mix but they also add warmth and ﬂavour, if you simply want to sprinkle some MPX magic onto your otherwise digital mix as an output mastering solution. As a processor for individual track elements such as drums and lead guitars it adds wonderful layers of warmth and depth, so if you're about to buy into the retro trend, MPX should deﬁnitely be among your plug-in contenders.